Team Honda Research and Team Honda Research-West kicked off their bids for 2010 Sports Car Club of America (SCCA) national championship titles during the weekend of January 22-24 at the inaugural race of the Southern Pacific (SoPac) division season last weekend in Fontana, California. 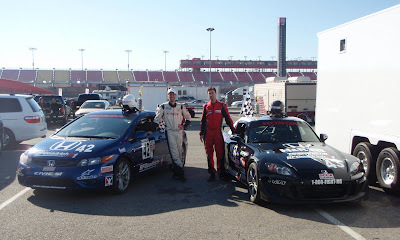 Lee Niffenegger and Matthew Staal piloted their Honda Racing/HPD BFGoodrich Honda Civic Si machines to first and third place, respectively, in the SSB class while Sage Marie took home first-place T3 class points in his Honda Racing/HPD BFGoodrich Honda S2000. Set at Auto Club Speedway, against a backdrop of snow-covered mountains following a week of storms, Niffenegger started from pole and was never challenged for the lead en route to the checkered flag. Meanwhile, Staal was embroiled in a heated, back-and-forth battle for second place with an SSB Mustang before being hit from behind by a T2 class driver, who was subsequently disqualified for his actions. Marie ran uncontested in T3, qualifying ahead of, and ultimately beating, faster American Sedan and T2 class machines. 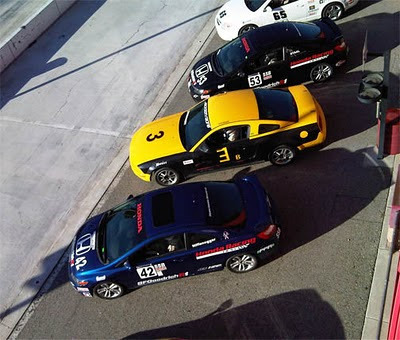 The team’s next race is February 27-28 at Willow Springs (Calif.) International Raceway.